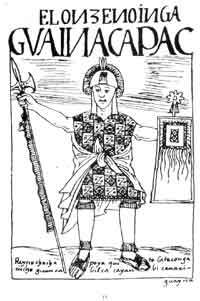 As the Sapa Inca, Capac went on many military campaigns to extend the reach of the Inca Empire To the south, he extended the empire to Chile and Argentina, and to the north, he movied into Ecuador and even Colombia. To help keep control, Huayna Capac created two capitols within his empire. Cuzco, the traditional Inca capitol, would manage the south, while the stronghold of Tomebamba would have control in the north. Under Capac, the Inca Empire reached its greatest size, covering much of western and central South America, and the Empire was populated by over 200 distinct ethnic groups. Huayna Capac was also very involved in public works. He helped fund the building of temples as well as food storehouses. He also expanded the Inca road network to allow food and messages to travel quickly through the Empire. The Inca road network was one of the best road systems in the world at its time. Even though Huayna Capac probably never encountered a European, Spaniards had already been as far as Colombia, bring their diseases with them. Most believe that Capac died of smallpox that he contracted while campaigning in Colombia in the 1520s. Capac was the last great emperor of the Inca, for after he died, a power struggle would leave the Inca weak and were easily conquered by the Francisco Pizarro. Huayna Capac is on our list for ruling the Inca Empire at the height of one of the most power civilizations in America and the entire world.